Our gay owned and operated large vacation rental condo was recently redone, including carpet, tile, paint, counters, ceiling fans, furnishings and is an oversized one bedroom/bathroom upper unit with a California king-size bed. Two 60” Samsung smart TVs located in the front room and bedroom, high definition expanded cable, WiFi and unlimited long distance calls to Canada and Mexico are included. 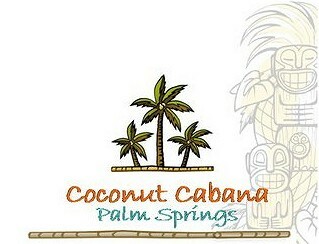 Tastefully decorated with a mid-century/tiki flair will make you feel like a touch of the islands has graced the desert. Conveniently located near fine dining, shopping, grocery store, and casino.